At ABC Rental Center, we specialize in linen rentals. 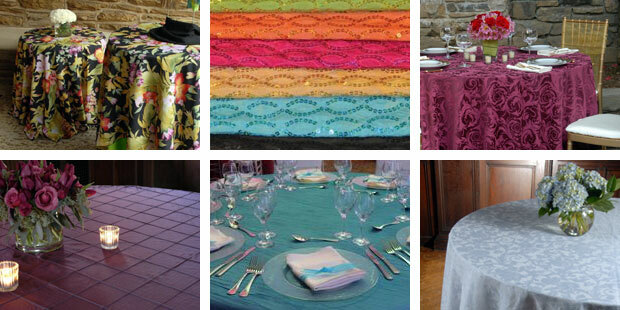 You will be amazed at the vast variety of colors, fabrics and sizes we can provide for your next event. All of our linens are laundered on our premises, assuring that your special event will be set with fresh, pressed linens. Once your party is over, all you need to do is bundle your linens in the bags provided. Please click here to view our in-stock linen selection, including skirts, tablecloths, runners, napkins, and drapes. Please click here to view our extended linen selection, available by special order. At ABC Rental Center we know how important the dressing on your special event can be, so we work hard to be sure your linen rentals are perfectly laundered and delivered on time. Throughout Cleveland and all of Northeastern Ohio, we’re here to help.